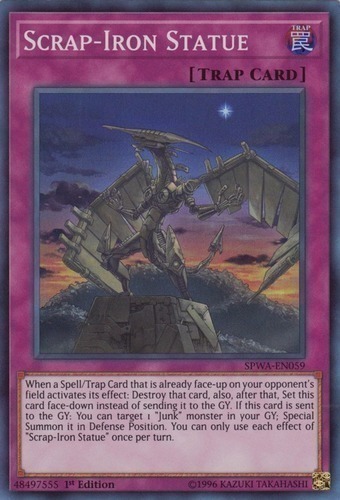 When a Spell/Trap Card that is already face-up on your opponent's field activates its effect: Destroy that card, also, after that, Set this card face-down instead of sending it to the GY. If this card is sent to the GY: You can target 1 "Junk" monster in your GY; Special Summon it in Defense Position. You can only use each effect of "Scrap-Iron Statue" once per turn.